SoundCloud’s financial results for calendar 2016 are now public, and they reflect a business with serious fiscal issues. That’s not anything unexpected, of course: in summer 2017, the Berlin-based firm slashed 40% of its workforce in a dramatic cost-cutting move, while its then-CEO (and co-founder) Alexander Ljung admitted that it might “run out of cash” without further financing. That financing was then secured in August last year, via an investment led by The Raine Group and Singapore-based Temasek – as ex-Vimeo exec Kerry Trainor replaced Ljung as Chief Exec. In SoundCloud’s newly-posted 2016 financial results (at the UK’s Companies House), the firm confirms that the Temasek/Raine Group-led investment bundle amounted to $170m. 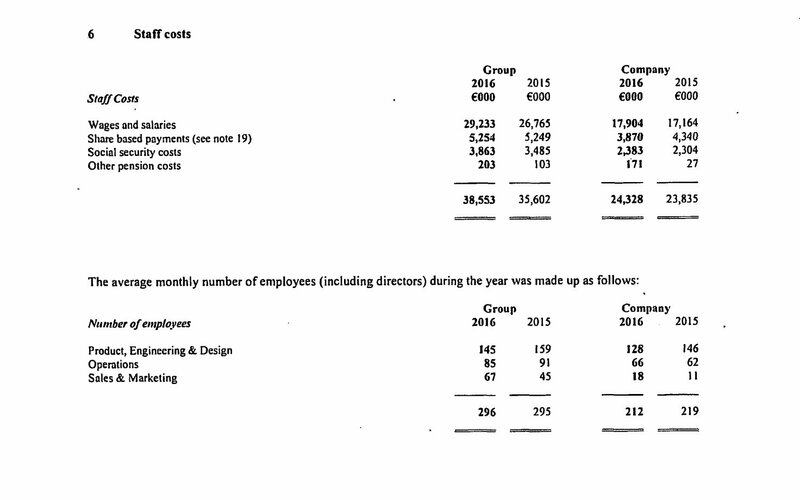 The Companies House documents also confirms that, in 2016, SoundCloud posted sales of €50.3m ($56m), up 89% year-on-year. 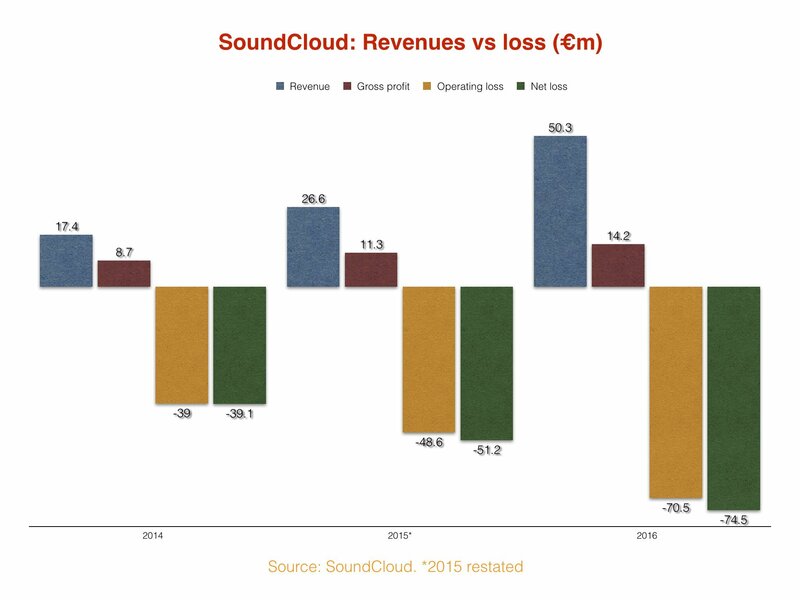 That impressive growth in revenues was tempered, however, by a 136% jump in SoundCloud’s cost of sales – including royalties paid to music rights-holders – which hit €36.13m ($40m) in the year. 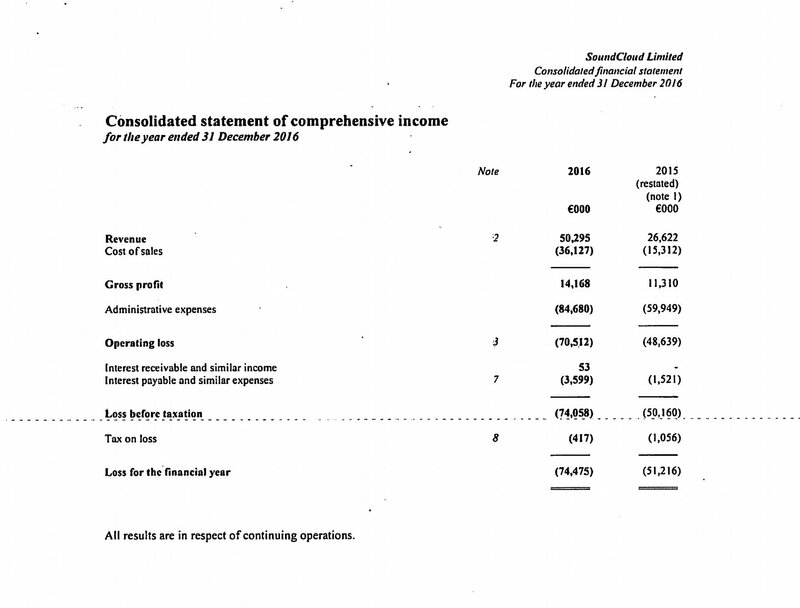 In turn, that meant SoundCloud’s gross margin stood at 28.17% – or, in other words, that it paid out 71.83% of all the money that came in to rights-holders and other external costs. Meanwhile, its operating losses widened 45% to €70.51m ($78m), with its net losses also growing 45% to €74.48m ($82m). SoundCloud’s workforce at the end of 2016 (prior to that 2017 staff cut) grew very slightly from 295 (in 2015) to 296 (in 2016) across the whole of the SoundCloud group. In terms of the company’s core business, its staffing levels dropped slightly in 2016 from 219 to 212. One other item of note: the Companies House filing confirms that, since last year’s $170m investment, the ultimate controlling party of SoundCloud Holdings is located in the Cayman Islands. Earlier this month, new SoundCloud CEO Kerry Trainor revealed that the firm’s revenues across 2017 topped $100m. He added that SoundCloud “has never been healthier financially”. Considering that the company posted €50.3m ($56m) in sales in 2016, that would mean last year must have seen topline growth of at least 79% at the company.